This section comprises the southern Great Basin in the Basin and Range geomorphic province It is in MLRA 29 Section 341F was extended into California after the Ecoregions and Subregions of the United States map was prepared The extent of this section and its’ subsections is shown on the Ecological Units of California, Subsections map. Geomorphology Widely separated short ranges in desert plains Contains isolated mountains, plateaus, alluvial fans, playas, basins and dunes Basin and Range geomorphic province. Lithology Paleozoic marine sedimentary rocks, Quaternary, Tertiary and Miocene volcanic rocks, Mesozoic and Jurassic granitic rocks, and alluvial deposits. Soil Taxa Aridisols, Entisols, Inceptisols, Mollisols in combination with thermic, mesic or frigid soil temperature regimes and aridic, xeric or aquic soil moisture regimes. 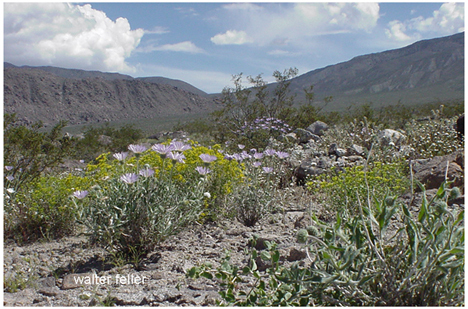 Vegetation Predominant potential natural communities includes the Big sagebrush series, Singleleaf pinyon series, Utah juniper series, Low sagebrush series, Shadscale series, Mixed saltbrush series and Bristlecone pine series. The following series are found throughout the California portion of the section and are not restricted to or extensive in any subsection. Series dominated by exotic plants are not listed under subsections unless they are extensive and stable. Series dominated by exotic plants: Tamarisk series. Series that can occur in all subsections, but are not extensive: Bulrush series, Bulrush - cattail series, Cattail series, Cordgrass series, Duckweed series, Mosquito fern series, One-sided bluegrass series, Pondweeds with floating leaves series, Pondweeds with submerged leaves series, Sedge series and Spikerush series. Series restricted to riparian settings: Arrow weed series, Black willow series, Fremont cottonwood series, Mixed willow series, Narrowleaf willow series and Red willow series. Reptiles include desert tortoise, several species of rattlesnakes and chuckawalla lizard. Elevation 1000 to 11000 feet. Precipitation 4 to 20 inches. Growing Season 100 to 275 days. Surface Water Characteristics Mostly bedrock controlled channels in mountains that carry seasonal flows to alluvial channels below Most channels terminate in basins within the section. Fire: Areas with less than about 8 inches of rainfall rarely support enough vegetation to carry a fire Fire occurrence in areas receiving more than about 8 inches has been influenced by introduced grasses Fires are variable in frequency and intensity. Climate: Flash floods are commonly associated with the irregular occurrence of precipitation events. Land Use. Composition and successional sequence of some communities has changed because of plant and animal species introduced between the late 1800’s and early 1900’s related to mining and grazing Since the early 1900’s, significant effects on some plant and animal species occur at widely scattered locations associated with military testing and recreational activities. Subsections Six subsections of the Southeastern Great Basin section occur in California.